Vampires and werewolves are exhausted and zombies are all in vogue now, thus Warm Bodies arrives just in time to usher in the era of teen zombie love stories. 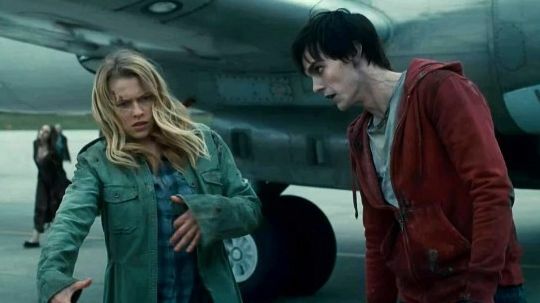 A curious but earnest and amusing attempt to make the zombie something a pretty girl could fall for, Warm Bodies stars Nicholas Hoult from Skins and X-Men: First Class as R, the most sensitive, intelligent zombie there ever was. It's all on the inside, though. On the outside, he's still a zombie (albeit attractive and one who isn't obviously physically degenerating and shedding body parts and viscera) but on the inside, he yearns to be able to express all these feelings he still has and be... normal. Warm Bodies finally presents the life of a zombie from the zombie's point of view in a clever, illuminating way. But as a zombie, Hoult still needs to eat brains, at least for a while, until he meets a girl. On an excursion for brains, Hoult meets normal human and very pretty Julie, played by Teresa Palmer. Hoult conveniently eats her estranged boyfriend's brains and conveniently inherits all his memories of her. Next thing he knows, he has the hots for Palmer and, shades of King Kong, Hoult takes her back to his love shack, an abandoned airplane, which he's spent an untold amount of time filling with nick nacks and 80's vinyl records because they "sound... better..." "What are you?" a baffled Palmer wonders out loud, and the answer is the most fanciful zombie creation ever, calculated to the bone for her - and girls in the audience - to fall in love with. Which Palmer does, like clockwork. How can she resist his loving stares at her and how he doesn't talk too much and saves her from other zombies and even worse, the murderous CGI animated corpses ("Bonies") zombies eventually turn into? Warm Bodies offers the playbook for girls on what to do on dates with a zombie. Hoult has a best zombie friend, Rob Corddry, who wants to eat Palmer's brains at first, but soon Palmer and Hoult's weird relationship triggers something in Corddry and the rest of their zombie brethren. Zombies can change, they can regain their lost humanity - Warm Bodies champions an optimistic take on the zombie that anyone living in the zombie apocalypse of The Walking Dead would never be able to accept. Having a hard time buying into this himself is John Malkovich, Palmer's father and the military leader of the what's left of the humans. One can understand how Malkovich has trouble seeing his daughter as serious about her zombie boyfriend becoming human again. It defies every convention ever known about zombies. Palmer's cheerful best friend Analeigh Tipton has a much funnier take on Hoult when he shows up at humans' walled city compound looking for Palmer on a balcony, riffing its inspiration Romeo and Juliet. Unlike the Montagues and the Capulets, Warm Bodies posits human and zombie can live together in harmony. Let the two crazy kids in love lead the way. And to its credit, at no point does Palmer ever consider becoming a zombie herself, so she's got her head on straight and has one over on Bella Swann.